The Orion Skyquest XT8 telescope is a Dobsonian reflector tool, which is considered one of the best choices for amateurs who are just getting started in the astronomy field. As a mid-range telescope, the Orion Skyquest XT8 Classic Dobsonian telescope manages to strike the perfect balance between efficiency, affordability, and portability. 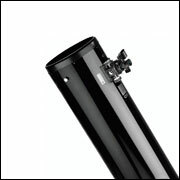 The brand’s reputation precedes it: Orion Dobsonian telescopes are known for their sturdy frames and crisp images. In this article, we review the Orion Skyquest XT8, looking at its specs, features, accessories, pros, and cons. 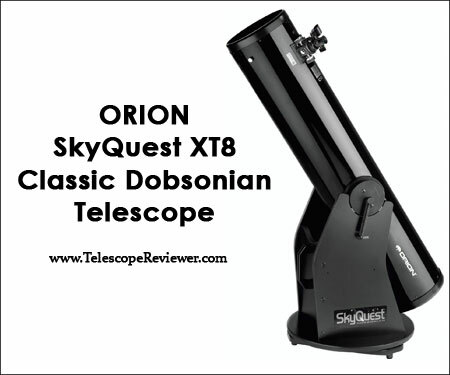 What Is the Orion Skyquest XT8 Classic Dobsonian Telescope? What sets Dobsonian telescopes apart is their ease of use. This is their biggest selling point, and the Orion Skyquest Dobsonian is no different. The perfect combination of features easily makes it rank as one of the best telescopes for beginners of all times, making it appropriate both for kids (age 12 or higher) who simply want to look at the sky and for adults who are starting to flirt with astronomy. The stunning image clarity and the generous kit box are just some of the reasons the Orion Skyquest XT8 Classic Dobsonian telescope is a favorite among beginners. The Orion Dobsonian XT8 sports an 8-inch main mirror. It has a 1200mm focal length which gives it an f/5.9 focal ratio. The 46.5-inch tube is covered in steel, making for a sturdy base. The Orion Skyquest XT8 Classic Dobsonian telescope is not among the lightest telescopes out there. Weighing 41 lbs, it has CorrecTension springs. The additional tools that come with this XT8 telescope make it a great investment in the long run. The 25mm Plossl eyepiece comes in handy for any astronomy aficionado. The telescope’s box contains everything a beginner might need to start exploring the skies and learn more about our galaxy. The large aperture of the Orion Dobsonian XT8 guarantees exquisite results whether you want to take a close look at the Moon, Mars, Jupiter, Saturn’s rings, or go birdwatching. The clarity conveyed by the 8-inch aperture of the Orion Skyquest XT8 guarantees you’ll get breath-taking clarity on star clusters and nebulae. Although it’s not the most affordable telescope out there, the Orion 8 Dobsonian is packed with features that make it a wise investment in the long run. Of course, no instrument is only milk and honey. This one has flaws as well. Orion telescope reviews unanimously agree that acquiring an Orion Dobsonian instrument pays off down the road. You get the guarantee of a high-quality design and manufacture that is bound to last you through the years. The large mirror of the Orion Skyquest XT8 Classic Dobsonian telescope is unparalleled among telescopes in this price range, and it doesn’t come without benefits. The 203mm primary mirror allows users to spot nebulae in minute details, even from places where light pollution is at its worst. The f/5.9 focal ratio ensures you get a clear view of the Moon’s craters and Saturn’s rings. The Orion reflector telescope is suitable for kids age 12 or higher. It’s not complicated to set up, and it can make astronomy appealing and interesting to learn. 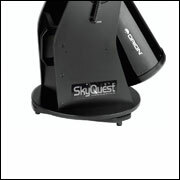 All the accessories that come with the Skyquest telescope are more than what an amateur can need to start off. As one Orion xt8 review remarked, the tools make for a semi-proficient kit that is great both for beginners and intermediate users. The steel tube of the Orion Skyquest will effortlessly slide on the base, enabling users to rotate it as they please. The Orion XT8 telescope reviews have sung its praises, emphasizing the extreme clarity of the images, the stunning quality, and its user-friendly features. Almost all Orion telescopes reviews claimed that the weight of this telescope can be a huge drawback, especially if you like to hike to higher places that are more suitable for star gazing. While the instrument will fit the bill for beginners and astronomy enthusiasts with little experience, the Orion XT8 telescope is not suitable for more advanced users. The basic package does not include additional lenses, which renders it redundant for all seasoned users. 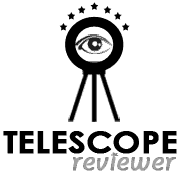 One Orion Skyquest XT8 Classic Dobsonian telescope user review complained about the azimuth bearings, which leave a lot to be desired. Instead of an even motion, the complainant remarked a rough motion that shouldn’t exist in a Dobsonian telescope. You will need a small wagon to carry it around, since it is quite heavy. According to one customer, the finder scope loses alignment quickly, especially when you have to transport the telescope from one place to another. Another reviewer mentioned having issues tightening the telescope on the base, and said that the base can be bulky. There are no handles on the telescope that you could use to move it around faster. 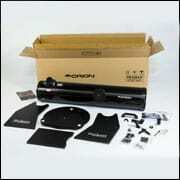 Unlike the Orion Skyquest XT8i computerized intelliscope, the XT8 is more affordable, and comes with more accessories. 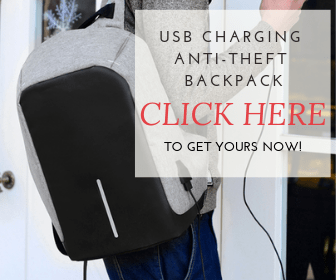 You can get the best deals on online retailing website like Amazon, where it’s sold at less than $400, and where you might benefit from free shipping as well. Other offers can include a gift wrapping feature and second-day delivery if you missed a birthday. This beginner’s telescope allows astronomy enthusiasts to see the Moon, planets like Mars, Jupiter, and Saturn, as well as distant celestial objects like star clusters, galaxies, and cloudy nebulas. Its impressive features make for an unequaled performance in its price range. The telescope boasts 8-inch diameter reflector optics, a 2-inch Crayford focuser that you can use with 2-inch and 1.25-inch eyepieces, an EZ Finder II reflex sight, a 25mm Sirius Plossl eyepiece, a collimation cap, and the Starry Night software. The Orion CorrecTension springs are also worth mentioning, since they help you set up the telescope easily, and help it remain balanced. The included software helps beginners learn more about the sky and the stars. All in all, this telescope boasts a stellar performance considering its price point. Taking care of this instrument can pay off in the long run, if you plan to use your Orion 8 Dobsonian telescope for years. This involves proper storage, as well as adequate handling. Keep the caps on the lenses when you are not using them to prevent scratching and dust getting within. You also shouldn’t use regular cleaners to remove dirt or stains from your Orion Dobsonian telescope. Stick to a microfiber cloth that won’t damage the fragile surfaces, and resort to a professional for removing more stubborn stains or dirt that is stuck within. Keep in mind that the clarity of your images will depend on the effort you put into keeping the instrument and its accessories dust-free. The brand is famous for being overly generous when it comes to extra accessories. The Skyquest XT8 eyepieces can attest to that. The included eyepiece is a 25mm Plossl. Users also receive a 2-inch Crayford focuser that is compatible with the 1.25-inch and 2-inch eyepieces made by Plossl. The collimation cap and the EZ Finder II with red dot reflex sight will come in handy to any beginner. The Starry Night software is not to be overlooked either, as it’s bound to be appreciated by astronomy enthusiasts of all ages. Orion offers a limited one-year warranty for any material or even workmanship flaws in the Orion Skyquest XT8 Classic Dobsonian telescope. You can contact them at 800-477-1001 for more details on the warranty. The Orion Skyquest XT8 Classic Dobsonian telescope is a great mid-range choice for beginners and intermediate users, and it comes with everything you need to get your passion for galaxies and nebulae off the ground. The biggest con is its bulky frame, but this can easily be overlooked if you don’t plan to travel with your telescope. Have you ever tested out the Orion Skyquest XT8? Tell us about your experience down below! 2. The f ratio is NOT what ensures a clear view! That depends upon the quality of the mirror and eyepieces, how well collimated the scope is, and how steady the skies are. The f ratio is immaterial in that, save that longer f ratios are more forgiving of poorer eyepieces. Thank you for your notice! We have corrected the typo and appreciate your attention to detail. What we did mean about the focal ratio is that it’s one of several factors that can ensure a clearer view for longer distances. We apologize if it caused any misunderstandings. I have been using the Dobsonian Orion 8 inch Skyquest for 5 years and the actual viewings, through the eyepiece, are way better than cassegrains, using 1.25 in EP’s. An 8 inch DOB brings in a-lot of light and resolves more deep sky objects (DSOs) than a bit larger CASS. It’s sharpness/clarity, how clear an object looks, is relational to primary mirror size (aperture). Quality is different, that’s something else altogether. The Orion 8’s quality beats the clarity of bit larger cassegrains. It performs like a 10-15 inch CASS easily. The Orion 8 will give you a better viewing/showing than a bigger Meade Cassegrain, that’s for sure. Even larger CASS’ are darker and too dark for DSO showings. Collimation is not a problem, just look, through the focuser & make sure your eye is in the middle. 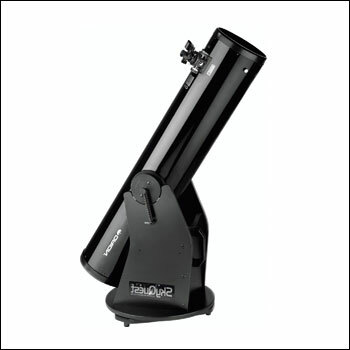 I use Orion Q70 2 inch EP’s & made an A in college astronomy, with this Orion 8 – class high. “For actual EP viewings, I prefer the 8 inch DOB over 10+ CASS. The mirror’s angular resolution is that good, which is scary because I’m sure the company hasn’t even increased mirror quality yet.